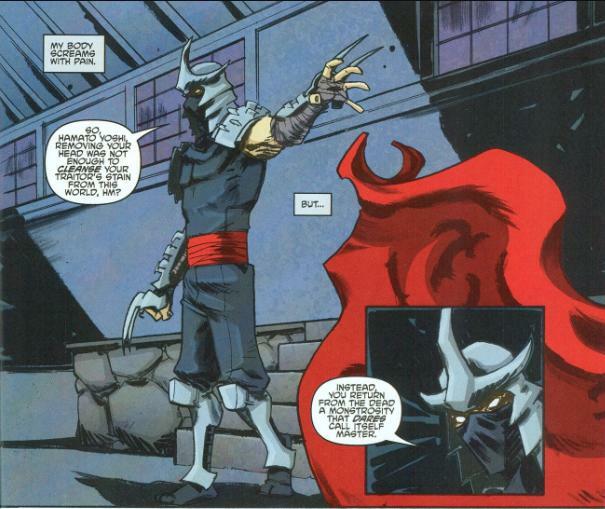 "Shadows of the Past, Part 3"
At Foot HQ, the Shredder orders Karai to nail Splinter with an arrow. 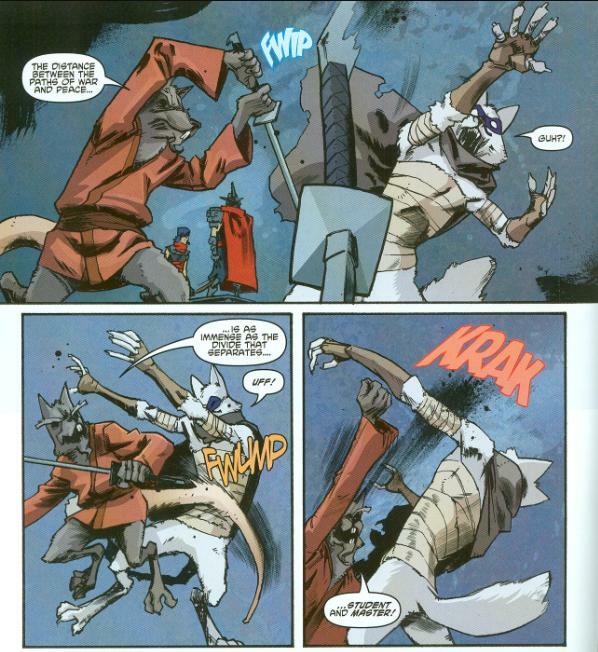 Splinter deflects the attack and Karai is shamed before her grandfather. The Shredder then orders his Foot Soldiers to swarm the old rat and exterminate him. Outside the Second Time Around shop, a young woman is peeping through the window at Leo, Raph and Donnie. 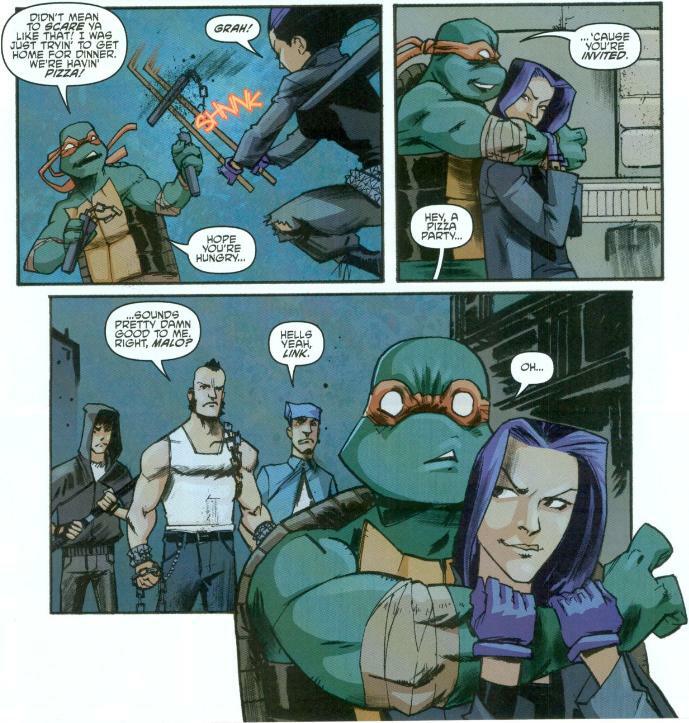 Mikey, returning with his pizza, notices her and takes her hostage. Suddenly, her fellow gangbangers (Chun, Link and Malo) arrive for back-up. Elsewhere, April drops Casey off, worried that she’s going to fail her morning genetics exam. Casey tells her not to sweat the exam or Splinter; the Turtles will find him for sure. The two arrange an after class “date” and April drives off. As soon as she’s out of sight, Casey slips on his hockey mask and gets ready to go back to “work”. Meanwhile, Splinter polishes off the Foot Soldiers. 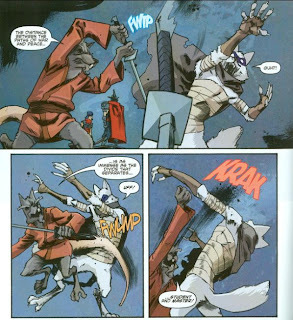 Shredder sends Alopex into battle and the two mutants confront one another. 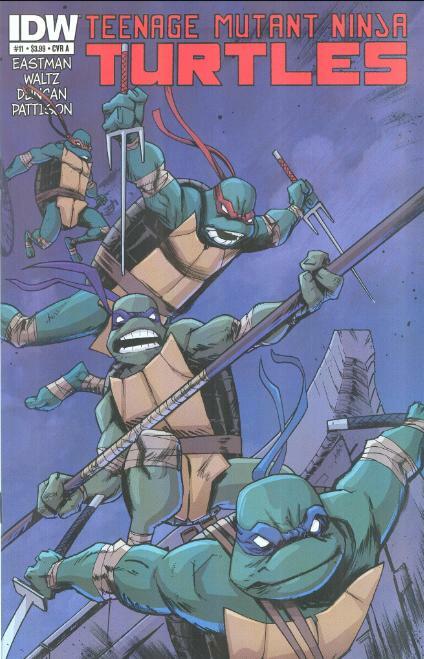 And at the Second Time Around shop, Leo, Raph and Donnie hear Mikey’s trouble with the thugs and join the fight. The gang members are no match for the Turtles, but before things can get really ugly, Casey shows up and recognizes their ring leader: Angel. Splinter takes on Alopex and tries to convince her that her mutation from fox to anthropomorph was done for evil purposes and that she is free to follow her own path. Alopex refuses to be turned and insists that she will kill the rat. Splinter knocks her out with an uppercut and confronts Shredder. And at the shop, Casey explains to the Turtles that Angel is the leader of his neighborhood’s gang, the Purple Dragons. Angel insists that they aren’t a “gang” anymore, but a "community watch", and that they’re sick of mutants and ninja causing trouble on their turf. Angel says that they’ve spotted a mutant cat and coyote running around with a dangerous ninja group called the Foot Clan. Casey assures Angel that the Turtles are on the up and up then asks her to show them where the Foot have been holding up. As the Turtles prepare to rescue Splinter for real this time, Don apologizes to Leo for not believing his story about the Foot existing. Leo says there are no hard feelings. And at said Foot HQ, Karai asks to take on Splinter, but Shredder forbids her, as she is not ready for such combat yet. Shredder mocks Splinter by reminding him of the loved ones that he killed, and after removing his cape, charges at the old rat. *This story is continued from TMNT (IDW) #10. The story continues in TMNT (IDW) #12. *TMNT Microseries #5: Splinter takes place during this issue. Specifically, between pages 7 and 8. *The Purple Dragons originally appeared in TMNT (Vol. 1) #1. Angel would seem to be based off of a character by the same name who appeared in the 4Kids animated series, in the episode “Fallen Angel” (though still a street urchin, she was much younger in the cartoon). *This issue was originally published with 4 variant covers: Cover A by Duncan and Pattison, Cover B by Eastman and Pattison, Cover RI by Zach Howard and Nelson Daniel, and Convention Edition by Eastman and Pattison. The pacing is starting to display its failings again with this issue; the events of which really could have been combined with the previous installment to little ill-effect. As it is, it has now taken the Shredder 3 issues and 3 months just to move from the spot he’s been standing in. 4 issues if you count the Splinter microseries. Pacing like that would make even “Dragon Ball Z” blush. The overall narrative of the book has been great and we’ve got a whole lot of stuff going on. And all of it is great. But when you only focus three or four pages to each subplot per month, it’s a small wonder it can take a quarter of a year for a character just to move their leg a little. The introduction of this book’s interpretation of the Purple Dragons has me curious. The idea that they’re a “community watch” and not a vicious gang of hooligans seems like a major change, but to some rather minor players from the previous continuities, so not a big deal. I don’t know if Waltz based this Angel off the one from the 4Kids cartoon, but they might as well be separate characters. The Turtles throwing down with them didn’t provide a whole heck of a lot of tension, as we spent the first four issues of this book watching the Turtles effortlessly beat on Hob’s gang. So despite the attempts at cliffhangers, there was never much to really be worried about. For my money’s worth, it was mostly the character moments that sold me on this issue. 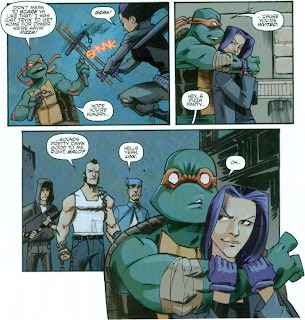 Splinter and Shredder trading verbal barbs, Casey and April developing their romance even further and Don conceding the existence of the Foot Clan to Leo were all payoffs to quite a lot of build up. In regards to that last one, I hope that the Don/Leo rivalry doesn’t end on one panel of apologizing, as it was perhaps the most interesting change-up in characterization defining the IDW book for me. My favorite moment, though? Angel describing the various mutants that have invaded her turf: A “pirate cat” and a “kung fu coyote”. Priceless. In a way, this issue felt a little like Mirage Volume 4; so many subplots going on all at once that the book has to divide its limited page space in too many directions. The end result is three months before a character has the opportunity to take a single step. "I don’t know if Waltz based this Angel off the one from the 4Kids cartoon, but they might as well be separate characters." I think it's a little obvious that it's based off the 4kids character. I know this Angel is older but that just comes with a new interpretation. Think about Robin in some incarnation he is older and in other he is younger. It doesn't mean they're not based off the same character. How come Splinter suddenly decides to kill? ("By any means")...he cut that guy across his midsection. A cut deep enough to that area (2-2 1/2 inches would spill your intestines) to take you out of a fight is deep enough to kill you if you aren't treated quickly. He has to know Shredder would view all who were potentially fatally wounded as worthless and leave them to die. Admkinistering a wound someone will die from in under an hour when you know they won't get help is the ssame as killing them outright. Agreed about Shredder. The man is a statue. I could not agree more about the pacing. This book moves at such a sluggish pace that after reading the first five issues I was almost ready to walk. Then when I read them all together one after another before the release of Issue 6 I found I actually enjoyed them. They are telling a great story, but it is taking them far to long to actually get to the good bits. Then just when you think you might be getting somewhere they break off and introduce some other thing that seems to be there just for nostalgia sake. Don't get me wrong I am happy there are new Turtle stories being told, and its more of a complaint about the comic industry today writing for the trades. Still as long as we have the Micro-Series giving us stories with Beginnings, Middles, and Ends I think I'll be okay.